There&apos;s a big gap between Utah&apos;s richest and poorest schools. Lawmaker hopes to close it. Equalization • Critics of the proposal to shift funds to lowest-funded districts say no Utah district is overfunded. 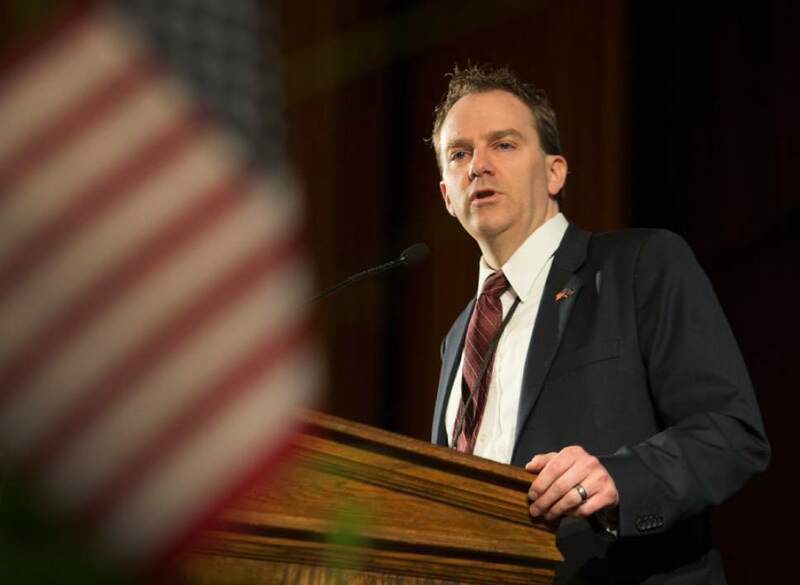 Leah Hogsten | Tribune file photo Sen. Lincoln Fillmore, R-South Jordan, gives his speech for the Senate District 10 seat at the Salt Lake County Republican Convention, April 16, 2016, at Cottonwood High School. Utah has long ranked last in the nation for the amount it spends, on a per-student basis, to support public schools. But there&apos;s another set of disparities in state school funding, because school districts supplement their budgets with revenues from local property taxes. An area such as Park City, with a comparably small student population and high property values, can generate more than three times as much tax revenue per student as Jordan School District, despite similar property tax rates. "If we are really concerned, as I am, that Utah is the lowest funded state in the nation," said Sen. Lincoln Fillmore, R-South Jordan, "we cannot internally say it is OK for some districts to have 40 percent, and operate on that, of what other districts are having." For the second year, Fillmore is sponsoring legislation to create what he calls the "equity pupil unit," which would set aside one-third of new per-pupil state spending for distribution among Utah&apos;s lowest-funded school districts. It would mean smaller funding bumps for districts on the high end of Utah&apos;s scale, leveling the playing field over time for schools throughout the state. "What I&apos;m after here is just a child-centered and -focused education," Fillmore said. "The value of your education doesn&apos;t change based on where you live or what model of school you attend." But critics, including Salt Lake City Democrat Rep. Joel Briscoe, counter that Utah education spending is already the most equalized in the nation. Through a funding formula called the weighted pupil unit, or WPU, public schools receive equal shares of per-student resources from the state&apos;s education fund. The equity pupil unit, Briscoe and others said, would only shift the already meager annual funding increases for Utah schools and exacerbate the real issue with education spending: that the state simply doesn&apos;t provide enough resources to educate children. "There are no rich school districts in Utah compared to national standards," Briscoe said. "We are a grossly underfunded state. We lack the resources to help our kids, teachers and parents do the things that we know will help their children be successful." Heidi Matthews, president of Utah Education Association, the state&apos;s largest teachers union, echoed that view, warning against "solutions that merely equalize what is clearly insufficient funding." Try, try again • Fillmore introduced the concept of the EPU near the end of the 2016 legislative session, with little time for debate and discussion. But when lawmakers convene their 2017 session later this month, the legislation will have the benefit of months of discussion with school administrators, education advocates and policymakers. "We&apos;ve been able to work with him," Michael Anderson, a legislative liaison for Jordan School District, said of Fillmore. Jordan is among the bottom 10 school districts for the amount of revenue it raises from local property taxes, meaning the district would benefit from equalization. "The bill in its original form, it didn&apos;t help Jordan School District but it did help the lower-funded schools," Anderson said. "We were hoping for a situation where more districts could benefit." Fillmore noted that school district boundaries are arbitrary, in most cases drawn by lawmakers more than 100 years ago based on geography. As a result, Fillmore said, funding disparity is a problem created by the Legislature, requiring a legislative solution. But that argument, according to Briscoe, ignores historical perspective. Lawmakers may have drawn the boundaries, he said, but the value of local economies have shifted over time. "Park City is everyone&apos;s favorite whipping boy on this because they don&apos;t have a lot of students and they have a lot of wealth," he said. "Fifty years ago they didn&apos;t have a lot of wealth. Fifty years ago, they were a run-down mining community looking to stay alive." Briscoe said he supports the concept of equalization. But those efforts also need to preserve local control, he said, rather than placing more power over schools in that hands state lawmakers. "Are we saying that anywhere you live in Utah you can&apos;t go to your school board and ask for some changes?" Briscoe said. "The Legislature is going to dictate exactly everything for you? I think we&apos;re headed in that direction and I don&apos;t like it." But the school funding gap is only getting wider, Fillmore said, and districts with lower property values aren&apos;t able to make up the difference on their own. "Our question really needs to be about what is the best policy position for the state of every child," he said. By the numbers • Fillmore&apos;s bill assumes that per-student spending will increase roughly 3 percent each year, in keeping with recent trends. Under that scenario, all schools would receive 2 percent of the increase through the weighted pupil unit, with the remaining 1 percent distributed only to lower-funded areas through the equity pupil unit. For school districts that aren&apos;t part of EPU spending, that would leave little or no money left over after accounting for enrollment growth and increases in costs like health care and retirement. "We rely on at least a 2 percent WPU increase to just maintain what we have going," Anderson, with Jordan School District, said. "We&apos;re still bare bones on a lot of operations and still not where we need to be with teacher salaries or where we need to be with programs." That calculus goes to the heart of funding equalization, with many educators worried they&apos;ll be running just to keep up. "To take one third of that [funding] off the top and redistribute it is a concern to many people," Anderson said. For those reasons, discussion of Fillmore&apos;s bill sometimes turn to the Our Schools Now ballot initiative, which would raise $750 million by increasing Utah&apos;s income tax rate from 5 percent to 5.875 percent. Lawmakers are considering several alternatives to boost school funding without raising income tax rates, or a combination of moves that could blunt the ballot initiative. But if Fillmore&apos;s bill and a revenue boost were to pass, school districts would be guaranteed two-thirds of that new funding, with potentially hundreds of millions of dollars going toward equalization efforts. "That would be a good problem to have to deal with," Anderson jokes, "and we would welcome that." Fillmore was agnostic on whether his bill should be bundled with Our Schools Now as some form of legislative compromise. Whether education funding increases by $100 million or $750 million, he said, a portion of that money should go for equalization. "To the degree that there is new money in the education pot," he said, "I think a good use for whatever money goes there is to try to make sure that we can take care of those students that currently don&apos;t have the ability to generate much money on their own." Rich Kendell, co-chairman of Education First and one of the organizers behind Our Schools Now, said he&apos;s concerned about the effect Fillmore&apos;s approach would have on the weighted pupil unit, which is designed as an equalized per-student formula. Rather than subvert an already equalized funding stream, Kendell said, lawmakers should look for other methods to address disparities, as they did with a 2015 bill that raised $75 million for lower-funded districts by adjusting a statewide property tax. He said it&apos;s an implicit error in Fillmore&apos;s bill to assume some districts have enough money and can afford to share resources with their lower-funded neighbors. "All school districts in this state are having various kind of financial difficulties," he said. "They have real needs and they have not had a solid funding stream over the last 10 years." The leaders of Our Schools Now have repeatedly said they&apos;d be willing to suspend their initiative  which is planned for the 2018 ballot  if lawmakers are able to find a solution to school funding. But Kendell, with Education First, said he doubts the Legislature&apos;s ability to do that given the politics of school funding and taxes.